I've been having such fun working on my postage stamp quilt that I didn't realize it's been quite a few days since my last post! I'll thank Rachel over at p.s. i quilt for that! Thanks Rachel! 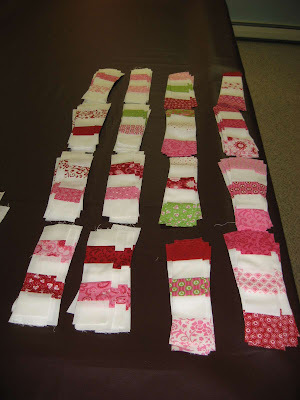 I recently joined up with Rachel's Postage Stamp Quilt Along to use up some fabric in my stash. When I got to the part where I had to cut apart my strip sets, those pretty little alternating print and white sections that I showed HERE, I knew there just had to be a faster, easier and more accurate way to do that job. I had read in the Flickr group discussion about some kind of special ruler that some people had used and it sounded like a tool I might want to add to my collection. So I checked it out, liked what I saw, then promptly took a trip to my local Joann Fabrics where all quilting cutting supplies were on sale 50% off. This is the cutting ruler I started cutting my strips with. 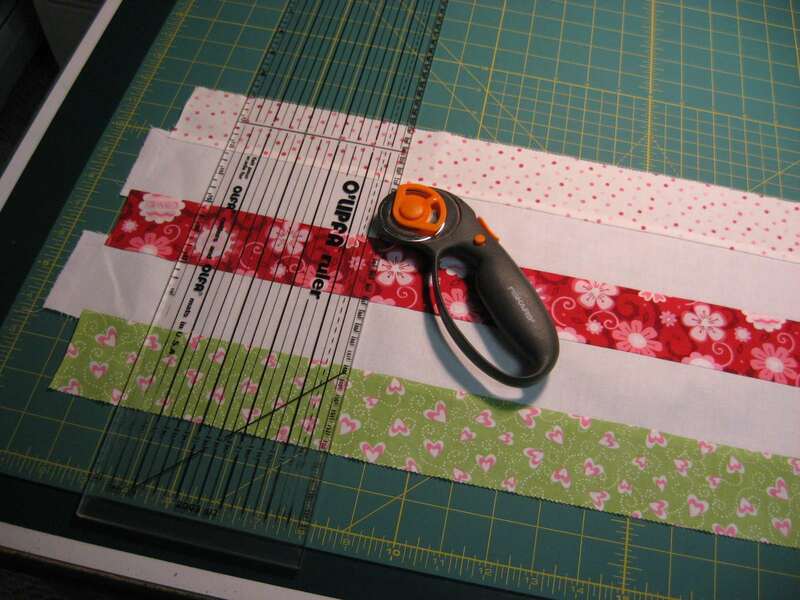 I only felt comfortable cutting one strip set at a time for fear of having them shift as I moved the ruler for each cut. It took me about 20 minutes to cut 3 strip sets. I knew my back would not hold out for long having to cut like this! After I came back from my little shopping trip, I got right to work using my new Shape Cut Slotted Ruler. Because of the slots in the ruler, I did not have to move it for each cut, so I was able to stack three strip sets for cutting all at one time. I might have even been able to do more, but three at a time was where I stopped! In no time at all, I had all my strip sets cut and stacked neatly! If you want to see a little video about this handy helper, you can go HERE and check it out. Then check your sale flyer for a good coupon to your local craft store and get yourself one of these great time savers. You'll love it! After cutting all the strip sets, I collated them into piles for each 5 x 5 block and spent a few days sewing the blocks together. I had enough for about 53 blocks. That is where I stopped and now I'm waiting for Rachel's next instruction. I am pretty sure I know what it will be, but I'll wait anyway! I'll show you all my blocks laid out in random order next time. This is going to be an awesome quilt! Do you have any super time saving tools that you can't live without? I'd love to hear about them in a comment! Oh thanks for the tip! I just went and bought one at 40% off at JoAnn's near me. 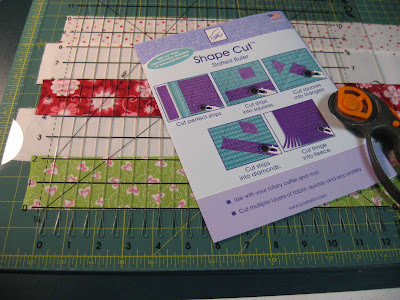 I used it just to cut pieces for some bags I'm making, not even patchwork, and it worked wonders. Now off to start a patchwork project! I really like the pinks, reds and green color combination. I've often seen those rulers but have never purchased one. I do have a coupon just itching to be used, so maybe I'll get one. 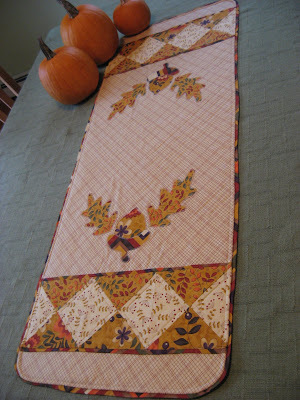 Several years ago I made a PS quilt and it drove me almost insane! Lovely to visit again, Mary Grace - wow! you have some work ahead of you there - looking forward to a finish! I'm not a new tool and gadget kind of gal but I love knowing about them and hearing reviews. This looks like a handy dandy one. YEAH!!! CONGRATULATIONS on your win over at Freckled Whimsey...that is great!!! I almost bought one of those rulers and after cutting all those strips i wish i had! i did mine one at a time because I too was afraid they would shift. 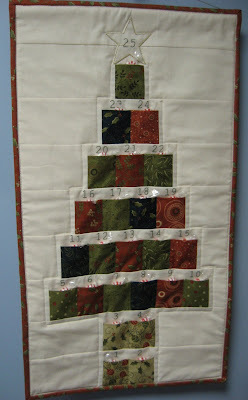 i LUV the fabric you are using...it is so happy and pretty!